Oft-ignored in the study of Canadian history or dismissed as a vestige of colonial status, the governor general's office provides essential historical insight into Canada's constitutional evolution. In the nineteenth century, as today, individual governors general exercised considerable scope in interpreting their approach to the office. 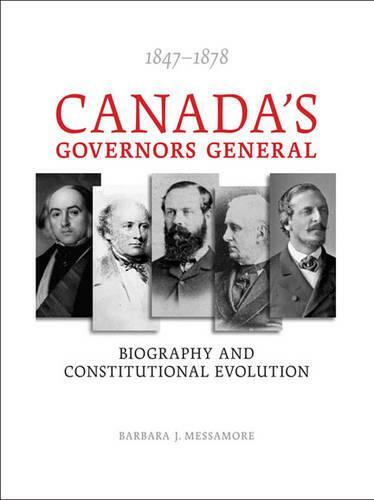 The era 1847-1878 witnessed profound changes in Canada's relationship with Britain, and in this new book, Barbara J. Messamore explores the nature of these changes through an examination of the role of the governor general. Guided by outmoded instructions and constitutional conventions that were not yet firmly established, the governors general of the time - Lord Elgin, Sir Edmund Head, Lord Monck, Lord Lisgar, and Lord Dufferin - all wrestled with the implications of colonial self government. The imprecision of the viceregal role made the character of the appointee especially important and biographical details are thus essential to an understanding of how the new experiment of colonial self-government was put into practice. Messamore's book marries constitutional history and biography, providing illumination on some of the key figures of nineteenth-century Canadian politics.